1) Weidmann & Groh wins Best of Show for its single-variety Boskop apfelwein at the Concurso de Sidra Internacional. 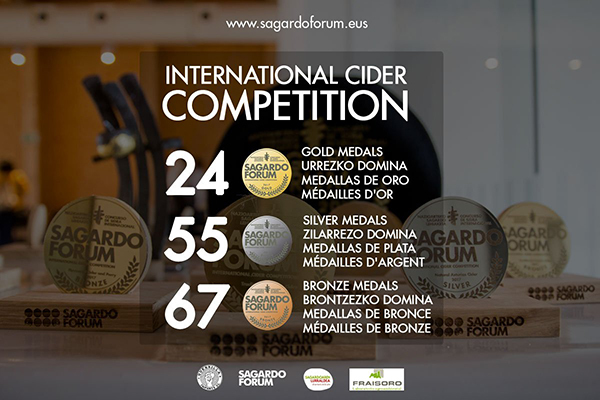 See Las mejores sidras presentadas al concurso internacional del Sagardo Forum for Best of Category winners, which include Angry Orchard, Brännland, Riestra, Willie Smith’s, and Zapiain. 2) Urban Orchard Announces Extensive Expansion Plans for 2018 according to Cider Culture. (Also in Asheville: TreeRock Social in Biltmore Village is the country’s newest cider bar.) And in Oregon, Atlas Cider Co. adding taproom in Portland’s Pearl District. 3) Graft Cider and Whole Foods Team Up to Make Hearth & Home Cider, a wild-fermented cider with hibiscus flowers, ground cinnamon, cloves, and sea salt. Not to be outdone, 2 Towns Ciderhouse’s Man Gogh Imperial Cider blends Mango and Habanero. 4) Armageddon Brewing—which just completed a successful crowdfunding campaign—is featured in Mead, hard cider may make comeback at brewery in South Jersey. 5) Cider Soms visit Honest Abe Hard Cider, Newtopia Cyder, and 101 Cider House in Cider Road Trip: Southern California. 6) Alex Jones’ latest food-and-cider pairing for Cider Culture is Pork Sirloin Steaks & Sour Ciders. Previous food selections include Spicy Tomato and Okra Stew and Vermont Cheese. 7) Cider Chat releases Tom Oliver on Making Perry, recorded at Franklin County CiderDays. (Friend-of-cider Al Yelvington has posted a video recording of the presentation). 8) Hans Edwin Winzeler interviews Mike and Albert Johnson of Herefordshire’s Ross-on-Wye Cider & Perry Company. 9) Tickets for Cider Summit Chicago—slated for February 17th in the Navy Pier Grand Ballroom—are now on sale. 10) Along Came a Cider reviews Blake’s Snapdragon. Cider Says reviews Lefevre Winter Cidre, Hérout à Auvers Cidre AOC Cotentin Extra-Brut, and Pierre Huet AOC Pays d’Auge Cidre. Cidercraft reviews Red Branch Cider Black Cherry. The Milled Apple reviews Somersby Original. Cider Society reviews Brooklyn Cider House Kinda Dry, Urban Farm Fermentory Sidrah, Blake’s Grizzly Pear, and New Forest Kingston Black. Sipology reviews Isastegi Sagardo Naturala. The Cider Drinker reviews Tillington Farm Acre #637. Cider Sense reviews three ciders from The Wobbly Press. And Cider Explorer reviews Hoflößnitz Original Sächsischer Apfelwein, Crone’s Original Organic Cider, and Royal Dog Cider.